Verdaderamente el paraíso en el océano con una gran piscina y nadar hasta taburetes de la barra. Relájese en la piscina al lado del mar con una taza de café mientras se ve la zambullida del pelícano para su desayuno. Todas las mañanas se puede caminar con la arena entre los dedos y encontrar estrellas de mar en la orilla del agua. La Buena Vida es una de 2 dormitorios totalmente equipados, 2 ½ pieza de baño de paraíso. Con Ticul (Stone) pisos en todas partes. Todos los electrodomésticos, cocina totalmente equipada y un hermoso patio de longitud completa y terraza equipadas con vistas al golfo de México. Hay un puerto de cruceros (Progreso), que está a unos 10 minutos en coche, que es justo lo suficientemente lejos de las multitudes de la actividad de cruceros. Usted puede tomar un paseo por la playa de Chelem y ver que está lleno de gente maravillosa. La ciudad de Chelem cuenta con un mercado de alimentos frescos con una gran cantidad de pescados y mariscos frescos y un montón de frutas y verduras frescas. Hay muchas cosas que hacer en Chelem, si tienes ganas de tirar de ti mismo lejos de la piscina y la playa. Mérida es una hermosa ciudad cultural con cerca de 1.000.000 personas. Hay un montón de tiendas con muchos centros comerciales, Walmart, Home Depot, Sams Club y Costco. También hay muchos casinos y muchas salas de cine también con algunas salas de cine VIP con cuero reclinables sillas y lámparas pequeñas y también un camarero / camarera para que puedas pedir comida. Si te encanta ir al cine, te encantará aún más en Mérida. NECESITAMOS TENER 1 DÍA ENTRE ARRENDATARIOS PARA LA LIMPIEZA. NO PODEMOS TOMAR LAS RESERVAS DEL MISMO DÍA. Ducha al aire libre, y una fuente cubierta y 2 fuentes al aire libre en el patio. Por una tarifa $$ podemos hacer que alguien entre y prepare una comida y también tendrán un mesero. Los días de entrada y salida necesitan 1 día entre ellos para la limpieza. We truly enjoyed our two week stay at La Buena Vida. Kelly and Tim have provided everything you need to enjoy your time in this fantastic location. The kitchen is huge and well supplied with everything you need to prepare a simple breakfast or a gourmet dinner. We did both on several occasions. If your not up to preparing a meal there are many great local restaurants and loncherias. La Playa is a short walk away and we had an amazing meal there for a more than fair price. The ribeye steak prepared by Carlos was phenomenal, not your traditional Mexican steak, it was thick and tender and grilled to perfection.There are many choices in Chelem as well and we had several meals there with the locals, unbelievably cheap and fantastic flavorful food! We caught the collectivo (10 pesos/person) into Progreso several times and had a couple great meals there as well. Progreso is the place to go for major grocery/booze runs, or Chelem has a nice market, several fruit/veggie stands and a "liquor" store for wine, beer and the basic liquors. Cheri and Brian, the property managers are fantastic and quick to reply to a "whatsapp", lol. We had no issues so we mostly contacted Cheri to call us a tuktuk to get a ride into Chelem or Chuburna, lol. A fun, cheap ride and you can catch them anywhere in town for the return trip, lol. They also helped us arrange a van/driver for a couple days of touring Mayan ruins and cenotes. Everything was great and the price was fair. Thanks guys, it was a pleasure meeting you! We used Omar (Kelly's recommendation) for transportation to/from the airport (Cancun) and the ADO bus terminal in Merida. Punctual, fair price and a real nice guy, thanks Omar!! We Ubered in and back from Merida several times. Great service and 300 to 400 pesos per trip. Super cheap for a 30 to 40 minute ride to El Centro. Ton's of things to see and do there. Rented bikes the second week and rode around Chelem and Chuburna every day. Super friendly people, never felt threatened, always a big smile and an hola. We loved the place and the people!! The new pool is amazing, chilling on the deck watching life in the gulf was awesome. Pelicans, dolphins, hummingbirds and of course local iguanas were daily visitors. Sunrises from the roof and sunsets from the deck or gulf were beautiful. I could say much more but running out of characters, lol.. Thanks for sharing your piece of paradise! Truly a gem!! Wow, I don't even know what to say! Thank you so much for such a wonderful review. It's great to see that you love the area as much as we do. Please come back anytime. Lovely, comfortable oasis at the northern point. 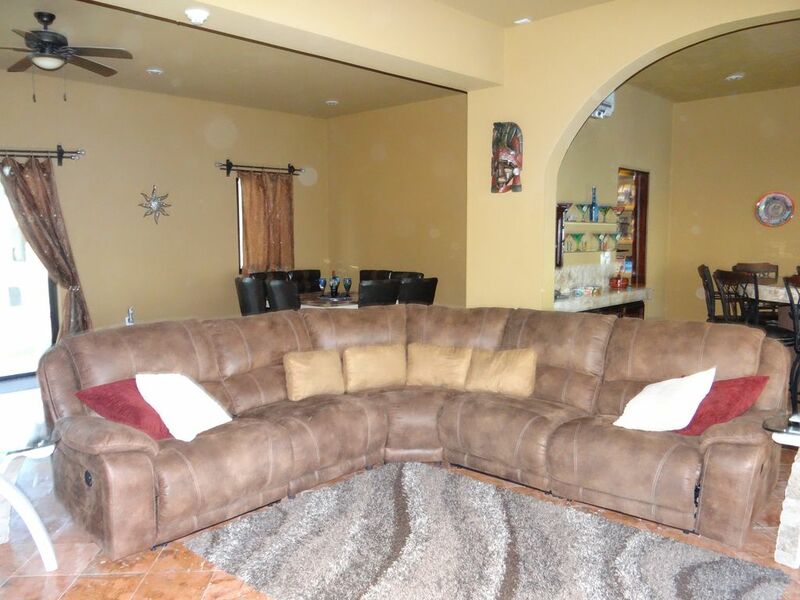 This spacious home is a great place for 4 people to retreat from daily activities. While there is no real beach to speak of- here the house and patio are built right up to the ocean with easy, shallow, smooth sand access to the ocean. This is a sleepy small community with plenty of local places to eat and only 30 minutes from Merida for great museums, dining, art and culture. And the beds are comfy! Thank you for your kind words. We are glad you enjoyed your stay and hope you come back. What a great place! We had the most amazing experience. The house has everything you need, full kitchen, 2 & 1/2 baths (master bath has a huge walk in closet)lot of beach towels, washer & dryer, Netflix and good TV channels. Kelly made the house as comfortable as possible, very clean too. The amazing pool, over looking the beach, is where we spent most of our time, especially during sunset. We watched many beautiful sunsets and had a few cocktails in the pool. The restaurants in Chelem are good and cheap, must go to Tacomayafor breakfast, very good. Restaurants in Progreso are a little more expensive but still reasonably priced. We went to Crabster, #3 restaurant in Progreso, beautiful and new, the food is amazing ( please try the fried octopus!). It was wonderful having you stay at our place that we call paradise. We are excited that you want to come back and stay with us. You were wonderful renters. There were four of us staying at La Buena Vida, and it was spectacular. The large house is clean and inviting. The view of the water from every room and the huge patio was beautiful. There were so many details attended to like lights under the master bed and kitchen island. There are board games, a huge TV with plenty of satellite and Netflix options. The ocean breeze was truly everything it was said to be...perfect for staying very comfortable in the August heat. Everything was made available and explained well by Steve, the property manager, when we arrived on site. Kelly provided an excellent document of how to easily get around, places to visit, and suggestions for restaurants. My husband and I were visiting family that lives in Merida so we are already familiar with the general area and stayed put at the pool and beach the entire time, but we plan to utilize the suggestions for future visits. It is invaluable information for someone who has never been. The kitchen is well stocked with appliances, pans, etc. so we could easily prepare meals. Plenty of snorkeling masks were available to enjoy the clear emerald water just steps from the house. There are rocky areas where we could enjoy looking at the sea life including sting rays, starfish, puffer fish (a little family had a special spot), and a wide variety of other fish. The infinity pool is divine. Perfect to relax, hear the waves, and enjoy the beautify water. We already plan to come back to this wonderful house again. Thank you, Kelly and Tim, for a marvelous opportunity to enjoy your home. We are so happy that you enjoyed your stay at La Buena Vida. It's also great to hear about the sea life that your saw. We will await your next visit to La Buena Vida. La maison est grande bien équipée, idéale pour 4 à 6 personnes. La cuisine ne manque de rien pour cuisiner. Les lits sont grands avec de très bons matelas. 3 salles d'eau. Une grande piscine, un barbecue à gaz, des transats et salons d,extérieur. Accès à la plage par un escalier en bois. Des jeux de société et jeu de flechette à disposition. Une grande télévision avec chaînes satellites, Netflix ou DVD à disposition. Wifi et ordinateur disponible. De quoi passer de bonnes vacances. Ce qui est dommage, c est que la cours devant est partagée avec d'autres locations (locataires qui peuvent être bruyants), ces locataires ont acces a la meme plage, en passant le long de votre terrasse, certains enfants peuvent oublier que votre piscine n est pas la leur! cette cours est pratique pour stationner les vehicules a l'abri et est fermée par un portail électrique, qui fonctionne une fois sur deux. Vous pouvez etre coincés à l'intérieur ou à l'extérieur, prenez donc vos précautions! D'autres éléments nécessiteraient un peu de réparations, un lave-vaisselle qui ne lave pas bien mais qui inonde votre cuisine! Thanks for the kind words. I was not aware of the gate working every other time and the dishwasher flooding. I will work with our property manager to get these things resolved. I am very sorry for your inconvenience. Such a beautiful home! It is a little isolated so it is helpful to bring supplies with you when you arrive. We didn't have a car so used Uber quite a bit to visit Chelem and Progresso. The newly renovated pool is so beautiful! I was very impressed with the response from the owner from a text I sent regarding some issues we had during a brief power outage (due to a storm). We would definitely love to stay here again! Hay teatro en directo, SINFÓNICA Y OPERA en Mérida. El pueblo de Cuzamá es conocido por la gran cantidad de cenotes encontrado allí. Especialmente singular es un recorrido que se puede hacer en esta zona, donde visitará tres cenotes. Si usted va a la hacienda en Cuzamá, puede contratar un guía que le pondrá en un carrito de la plataforma tirado por caballos por caminos interesantes a través de la campiña de los alrededores. Los principales cenotes son: Chelentún (el que se establecen roca), Chansinic'che (árbol con hormigas pequeñas) y Bolochoojol (nueve gotas de agua). El Chelentún Cenote tiene increíblemente agua azul y claro, con una excelente visibilidad. Estalactitas y estalagmitas se suman a su belleza única. Hay tanta belleza en los Cenotes. Some rates will be more during Mexican Holidays and are subject to change at any time.